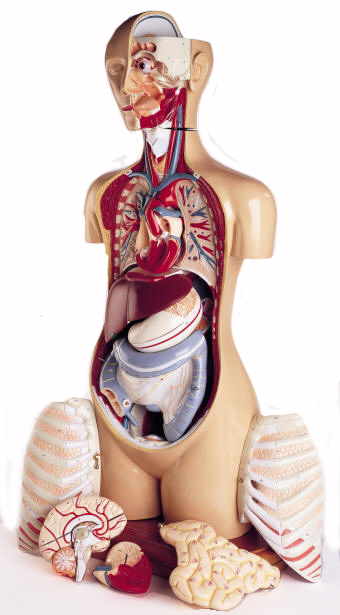 These teaching torsos have a detachable head and come with a hardwood turntable base. 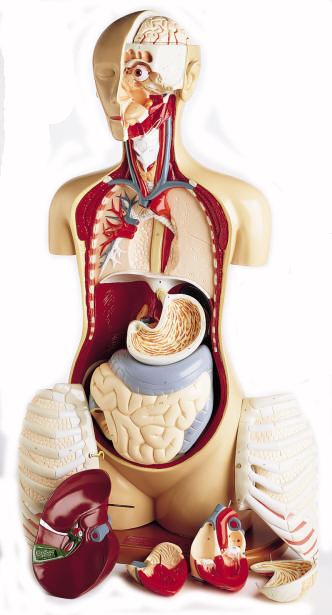 They feature 23 dissected or dissectible structure, 16 detachable parts and 300 hand-numbered anatomical features. Please Note: These are hand-made models, custom made to order. Exhibiting all basic anatomical details necessary for an introduction to the functional systems of the human body, the Basic Know Body has the following detachable parts: eyeball; brain half (one piece); left lung; right lung (showing pulmonary blood vessels and bronchioles); heart (two halves); liver with gall bladder and segment of diaphragm; one-piece stomach; one-piece small and large intestine unit; and one-piece torso and head unit. Rigidly mounted on hardwood base. Nineteen dissected or dissectible parts, and ten detachable parts.